This piece premiered first at the Eurofurence 21 art show. Being a huge Deus Ex fan, I was absolutely in love with the prequel Human Revolution and also devoured every page of the accompanying novel "The Icarus Effect". In both the novel and the game, a prominent character is the mercenary Lawrence Barrett. A huge and tough brute himself, he was covered with facial scarring and a mechanical augmentation replacement for his lower jaw. All of it topped off with his attitude and a bull ring through his nose made him a very intimidating character, even though he was only the first boss in the game. But I liked his design so much, that I kind of adopted it for this character and also added a few of my own twists and turns along the way. 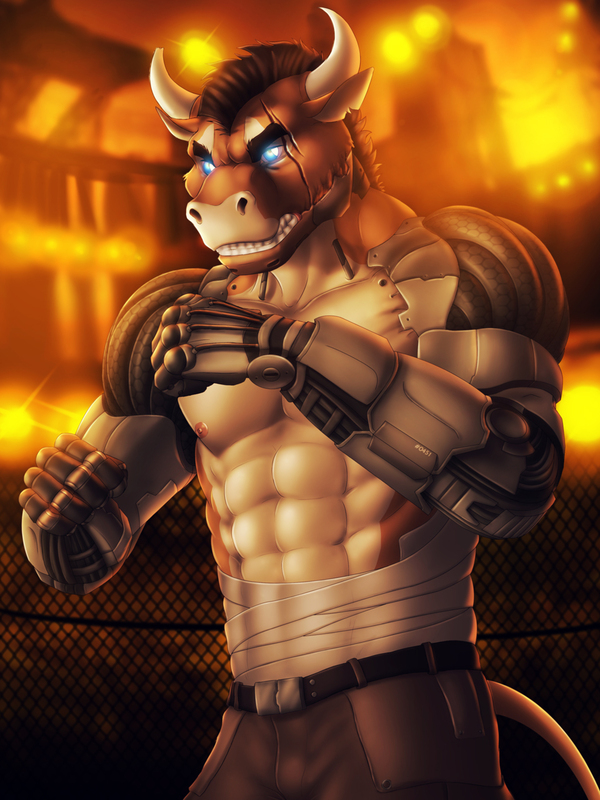 The final result is something less Deus Ex and more Mortal Kombat -esque as I was told that in the game series exists also a character with robotic arms. I really liked how this turned out however and I'm happy the print in the art show found a buyer, so thanks for that!